The Spartan Marching Band jacket traces its origins back to our first trip to the Rose Bowl in 1954. Upon returning, it was suggested by current members that the band adopt a distinct jacket with collar and buttons to help band members stand out on campus. That original design has remained consistent since, reflecting the same commitment to upholding tradition as the Spartan Marching Band. A jacket is earned only after a first-year member has completed their dress rehearsal, called “Freshman Dress.” This special rehearsal is the culmination of 10 days of dedicated grueling practice and rehearsal at Pre-Season Drills. Among the many protocols is one that allows the band member to don the jacket for the first time only after he or she has marched through the tunnel into Spartan Stadium. There is no better indication of the pride in Spartan Marching Band membership than to see this wool jacket worn on a day when lighter fare might be more comfortable. Each year, approximately 300 Alumni of the SMB arrive on campus for their annual fall reunion. The Spartan Marching Band jacket is worn by 70 year-olds standing next to recent graduates and current students. THAT’S TRADITION! Historically, students have had to pay out of their own pockets for the privilege of their own jacket, but in recent years, through the generosity of private support, the cost of jackets has been greatly subsidized. It is the goal of the Alumni Bands to provide these jackets free of charge to all incoming members of the SMB. With approximately 80+ new members each year, this would require roughly $12,000 annually in private support. You can help support future Spartan Marching Band members with a one-time contribution of $150, which will cover the cost of one jacket! For the past three years, thanks to the generosity of individuals like you, the MSU Alumni Band has been able to help cover the cost of a jacket for each new Spartan Marching Band member. Our goal is to continue this endeavor every year, so that our students can wear their jackets without worry and with pride. 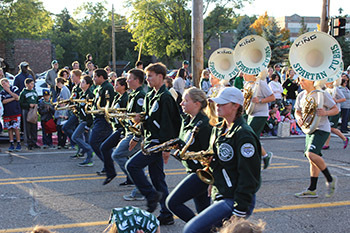 Funds received during this campaign will help to heavily subsidize the out-of-pocket cost of jackets for the 2019 incoming members of the Spartan Marching Band. The Michigan State University Alumni Band promotes camaraderie among MSU Band alumni through opportunities for active musical participation, to facilitate contact and communication within MSU Band alumni and to encourage alumni advocacy and philanthropy in support of the MSU Bands. *Make check payable to Michigan State University and write “Appeal 19OOPCF1SMBJA” in the note section.